This twelve-room town house is remarkable from several points of view: It is a relatively rare Canadian dolls' house, and an approximate copy of an actual house still standing (at 285 Park St. South) in Hamilton, Ontario.1 Not only is its external architecture related to an actual house, but its unusual hinged construction was probably inspired by actual plans for a dolls' house in an 1883 publication. Mrs. Ross-Ross declares that she of course remembers none of this, but that she is sure her father wanted to build a small house and he put the idea into her head. She adds, "My mother has told me that I was too young to appreciate my good fortune, and that I would amuse myself by taking all the furniture out of the house and making a procession of it on the floor where it was inevitably stepped upon and broken." What remained disappeared in later years. Mrs. Ross-Ross writes that she nearly lost her house in 1914 when, "in an excess of patriotism," she refurbished it and donated it to be raffled at a bazaar organized by the "Imperial Order of the Daughters of the Empire," to raise money for "comforts for soldiers." The teenaged owner was lucky: "$60 was raised, but no one came forward to claim their prize, so it was returned to me." Over the years it was lent to several children, and when it was retrieved in the 1940s, the only original piece of furniture which remained was a Morris chair. Mrs. Ross-Ross, who obviously inherited some of her father's talent, has built several dolls' houses of her own including a store, "Hall's Hardware," from her memories of such an establishment, very old, destroyed by fire in 1963.2 She decided to refurnish Domville House as it might look today if we were still living there." She added stairs to the attic, a continuation of the grand staircase in the front hall, "as it was very tiring for the family to have to fly up there all the time," and she also made all the doors with knobs converted from corsage pins. Then, in 1968, she gave her house to the Dundas Museum where it has been impressively fitted with machinery which permits it to open and close slowly - and automatically. The English publication Amateur Work described the making of a house of this plan in 1883 in three instalments of such complexity that (as I have written elsewhere) "Anyone who gives the instructions even the most casual perusal knows that building this house is not work for amateurs." 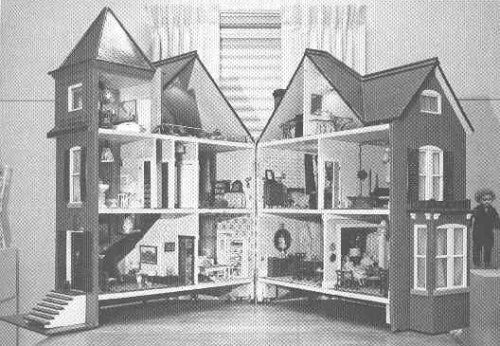 Mrs. Ross-Ross believes the article which, among other things, showed the "carcase" of the house in "isometrical perspective," inspired her father. A sample sentence gives the flavor and perhaps suggests how the house, basically two boxes hinged together, opens and closes: "As the boxes are drawn apart, and turn on the hinges, the point A travels along the dotted circle, in the direction of the arrow, to A' , F to F', C to C', and D to D', the points B and E describing semicircles, which it is unnecessary, on account of the space that would be taken up, to show in the diagram." 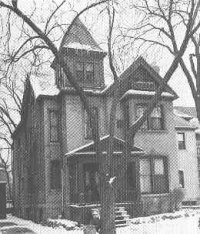 1 Unfortunately, the picture of this house arrived too late to permit a detailed comparison, but it can readily be seen that, except for the porch (which Mrs. Ross-Ross believes was added in relatively recent years), there is a remarkable resemblance to the dolls' house. 2 To be seen in the Stormont, Dundas and Glengarry Historical Society Museum in Cornwall, Ontario. Mary Domville was three years old when her father built her a dollhouse for Christmas. 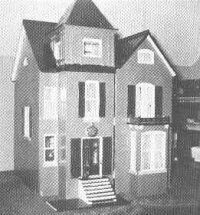 This unusual Canadian dollhouse is described by Flora Gill Jacobs in her book 'Historic Preservation in Miniature' as an interesting Canadian treasure because not only is its exterior patterned after a house still existing at 285 Park Street South in Hamilton, Ontario, but it also is thought that Mary's father was influenced in building the unusual hinged construction by dollhouse plans found in an English publication, 'Amateur Work' (1883). Mary Domville almost lost this dollhouse in 1914 when, as a teenager, she donated it to the I.O.D.E. for a raffle to raise money for 'comforts for soldiers', as noted by Flora Gill Jacobs. The house was returned to Mary when the holder of the winning ticket did not claim the prize. Later Mary, now Mrs. Ross-Ross, decided to refurnish Domville 'as it might look today if we were still living there.' All the original furniture, except for one chair, had been lost. The house has been fitted with machinery so that it slowly and automatically opens and closes to show an interior both charming and interesting to miniaturists and collectors. 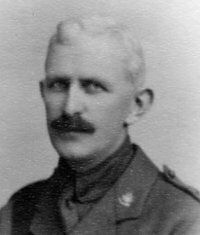 The Dundas Museum is located at 139 Park Street West, Dundas, Ontario and is open Monday to Friday from 10 a.m. to 4 p.m. From May 1 to October 31 the Museum is open Sunday from 2 to 5 p.m. This museum is well worth a visit as it contains, as well as another old dollhouse and an assortment of old dolls and toys, also life size exhibits of past times in Dundas and the neighbouring countryside. There is also a working model of the first paper mill in Upper Canada, a pioneer store and many other very interesting examples of early Canadiana.